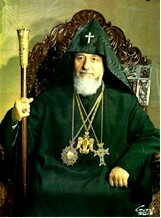 Catholicos Vazgen I reigned on the Seat of St. Gregory from 1955 - 1994, one of the longest in Catholicosal history. During these utmost critical years Vazgen I managed to prevent the collapse of the Holy Apostolic Church in the face of disputes and strives among the dioceses of the Holy See and also asserted a great degree of independence in policy making of the Church from the central authorities which otherwise controlled almost every aspect of socio-economic and political spheres of society. His remarkable reign extended to the era of the Third Republic. Catholicos Vazgen I will always be remembered in the hearts and minds of Armenians as a just, virtuous and devout shepherd of his people. The President of the Third Republic -- Levon Ter-Petrosian -- elected by an overwhelming majority of the voters was blessed by one of the longest reigning and most beloved Catholicos' of all time -- nearly 40 years -- His Holiness Catholicos Vazgen I. Religious freedom and the right of worship, were once again restored under the new government. MADE BY THE MASTER GOLDSMITHS. UNION OF TWO SEALED IN ONE OCTAGRAMIC -- 8 -- E T E R N I T Y. 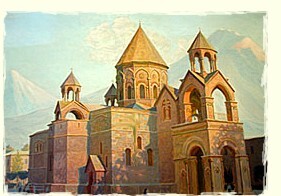 The Holy Apostolic Church of Armenia, also made great moves toward the reunification of the two wings of Apostolic Christendom, with the Mother See of Holy Echmiadzin and Catholicos of the Great House of Cilicia, that unfortunately to this day has not come to a full fruition. Catholicos Vazgen I began making preparations to mark the 1700 anniversary of adoption of Christianity as the official religion of the State - making Armenia the first nation to do so. In the fall of 1994, after a nearly 40 year reign [from 1955], Catholicos Vazgen I passed away, forever being remembered by the people of Armenia as their beloved spiritual leader. Catholicos Vazgen I undertook a tireless effort in renewing a number of ancient Armenian churches and reviving a number of institutions throughout the Holy See. PATRIARCHAL APOSTOLIC PANAGIA OF H. H. THE LATE CATHOLICOS VAZGĒN I. 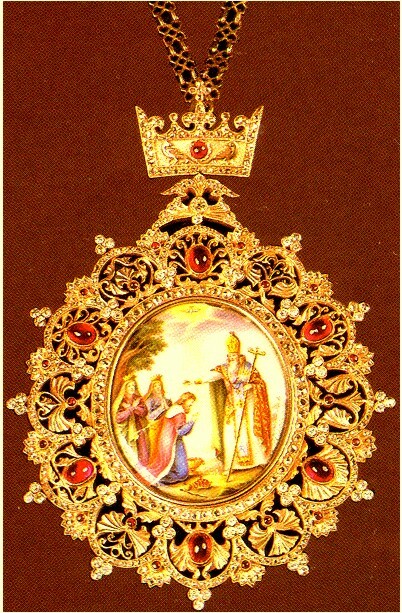 EXQUISITE CRAFTSMANSHIP BY ARMENIAN MASTER GOLDSMITHS. 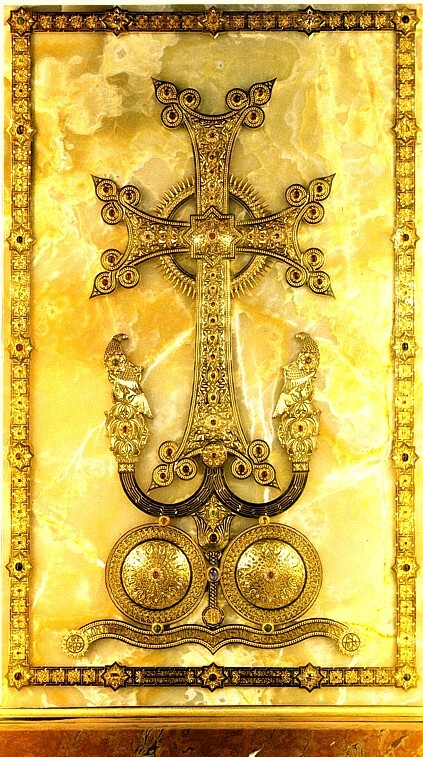 A number of treasures of the Holy See were saved -- thanks to his efforts -- with the establishment of the Alex Manugian [named after a prominent Armenian philanthropist] Museum of the Mother Church. Catholicos Vazgen I s successor became Garegin I, previously the Catholicos of the Great House of Cilicia, ordained in April of 1995, after the election by the Church Council of the Holy See. Garegin I began his reign with visits to the heroic people of Artsakh and different Armenian communities in the Diaspora. After the passing of Garegin I in 1998, the successor on St. Gregory's seat became Catholicos Garegin II [previously the Archbishop of the Ararat Dioceses of the Holy See], elected by the Church Council in October of 1999.